One of the best preserved thylacine pelts in known existence has come into the collection of the National Museum of Australia after spending nearly 100 years hidden away in New Zealand. The almost-complete pelt features rarely preserved details such as a nose, tail and the bones, tissue and ligaments of the paws. It is in remarkable condition after spending most of its life in a drawer at its collector’s home. National Museum Deputy Director, Ms Stephanie Bull, thanked the Australian Government which has supported the purchase through the National Cultural Heritage Account. ‘After an extensive evaluation process the skin was purchased by the National Museum of Australia in late 2018 for $250,000 which included a generous contribution from the National Cultural Heritage Account of $125,000,’ said Ms Bull. Head Curator Dr Martha Sear is excited to welcome the extraordinary skin into the National Museum’s collection. 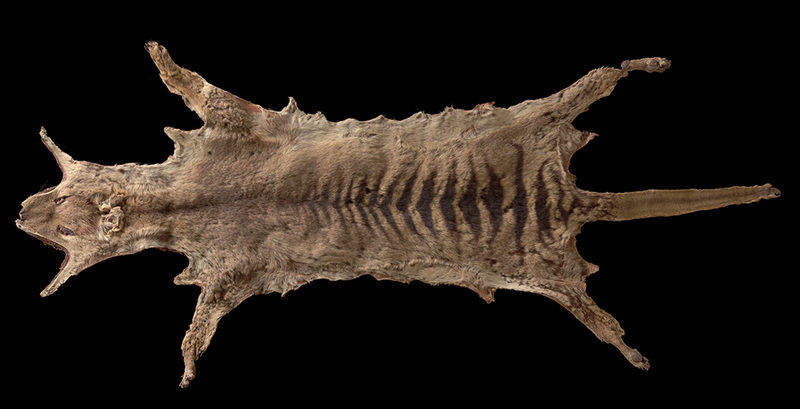 ‘The pelt is considered to be one of the best preserved specimens in existence, and one of the few remaining physical specimens of a species that has become a symbol of extinction,’ said Dr Sear. ‘The Museum has been lucky enough to acquire this remarkable specimen to add to the National Historical Collection to better represent Australia’s unique fauna and the environmental impact of species loss,’ said Dr Sear. The pelt was acquired by an avid fauna collector, Archibald Robertson, in 1923 and was passed down to his only daughter, Janet Withers upon his death in 1970. It came to the attention of experts in 2017 while on display in a New Zealand taxidermist and canoe hire business. Early settlers to Tasmania believed thylacines preyed on livestock. The Tasmanian government instituted a bounty of one pound per thylacine caught in 1888. The introduction of competitive species such as wild dogs, the fur and wild animal trades, foreign diseases including mange, and extensive habitat destruction also greatly contributed to thylacine population losses. The last known thylacine died on 7 September 1936 at Beaumaris Zoo in Hobart. Thylacines were officially declared extinct by the International Union for Conservation of Nature in 1982 and by the state government of Tasmania in 1986. Since this time, thylacines have become a symbol of modern extinction, and 7 September has become known as National Threatened Species Day. The thylacine pelt will join the National Museum’s current collection of which includes an incomplete thylacine pelt and the single largest collection of thylacine organ specimens in the world. The wet specimen collection also includes a rare preserved specimen of an adult thylacine – one of only five known to exist in public collections.